Marine Corps commandant, General David M. Shoup, makes a speech at the Veterans Day service at Arlington Amphitheater. 1. Large crowd seated in amphitheater. 2. President Kennedy seated, listens. 3. Shoup speaking: "We face the disheartening and distasteful fact that after many centuries of so-called civilization, man has been unable to prevent the killing and maiming of men, women, and children in war. Man has learned the secret of the atom, penetrated space, and plans to explore the universe. In many areas, science has lifted the load from man's back. The US has the highest standard of living the world has ever known. But man has yet to learn to live in enduring peace with his fellow man." 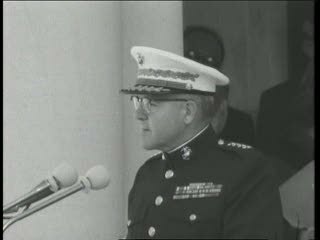 Chicago: “Vietnam: A Television History; General David Shoup at Arlington Cemetery for Speech,” 11/11/1963, WGBH Media Library & Archives, accessed April 22, 2019, http://openvault.wgbh.org/catalog/V_E55898DDF11C4D62961D991BF3875DAB. MLA: “Vietnam: A Television History; General David Shoup at Arlington Cemetery for Speech.” 11/11/1963. WGBH Media Library & Archives. Web. April 22, 2019. <http://openvault.wgbh.org/catalog/V_E55898DDF11C4D62961D991BF3875DAB>.